The scalable Texas map on this page shows the state's major roads and highways as well as its counties and cities, including Austin, the capital city, and Houston, the most populous city. To display the map in full-screen mode, click or touch the full screen button. To zoom in on the Texas state road map, click or touch the plus (+) button; to zoom out, click or touch the minus (-) button. To scroll or pan the zoomed-in map, either (1) use the scroll bars or (2) simply swipe or drag the map in any direction. (The scrolling or panning method you use will depend on your device and browser capabilities.) At any time, you can display the entire Texas road map in a new window or print this page, including the visible portion of the map. Texas' Interstate Highways connect its major cities and facilitate travel between Texas and its neighbors. I-10 traverses south-central Texas from east to west, while I-40 crosses northern Texas from east to west. I-30 runs from Dallas northeast to the Arkansas border, near Texarkana. I-35 begins at Laredo near the Mexican border and runs northeast through Austin and Dallas-Fort Worth, dividing into I-35E and I-35W as it passes through Dallas and Fort Worth, respectively. I-45 begins at Galveston near the Gulf of Mexico and runs north through Houston, to Dallas. Texas' auxiliary Interstate Highways serve its major metropolitan areas. I-110 provides access to downtown El Paso from I-10. I-410 encircles the city of San Antonio. I-610 loops around the city of Houston. I-635 loops around northern and eastern Dallas. I-820 encircles much of Fort Worth, except along the south side of the city. 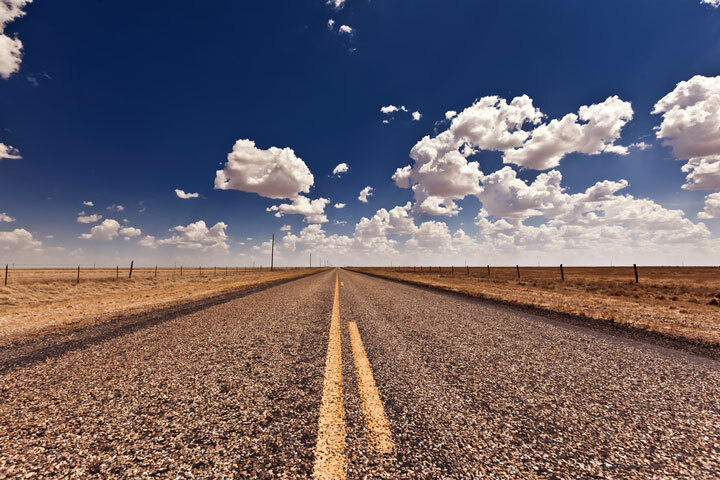 Although there are no officially-designated America's Byways in Texas, the state does feature several scenic routes and travel itineraries. Southwest Texas offers a road trip with surprisingly stunning backdrops through Big Bend Country. Balmorhea State Park is an oasis in the desert with a two-acre concrete swimming pool filled with freshwater fish and aquatic plants. 80,000-acre Big Bend National Park encompasses desert, grasslands, mountains, canyons, and the Rio Grande River, as well as countless species of wildlife. The 74-mile Davis Mountains Scenic Loop passes an observatory that is home to America's only world-class telescope available for public viewing. For more information about Texas' roads and transportation infrastructure, visit the Texas Department of Transportation website. For Texas road traffic conditions, visit the Federal Highway Administration's Texas Traffic Information page. Texas-Map.org is a State Maps reference source.